We've got time for one last roundup of breweries, venues and bottleshops added to the Crafty Pint directory since the last one. Usually, we post one of these every time we reach a dozen new additions in case you missed them as they were spruiked individually. This time around, however, we got a little ahead of ourselves and it turns out we've got a baker's dozen for you instead. This 13 brings the number of brewery, venue and bottleshop listings added to the site in 2016 to 73. It's a far cry from matching the rapid growth of the industry, but we've been expanding our team around the country in 2016 too so expect to see far more appear here in 2017 as we strive to make it as easy as possible for you to find good beer – and know the stories behind the beers and the people bringing them to you – wherever you are in Australia. So here's our final dozen(ish) for the year; below, you'll find links to the other five roundups from the year just gone. Black Hops Brewing (QLD) – Little more needs saying about this Gold Coast trio that hasn't already been said here and elsewhere. A colourful, ever-changing lineup of beers best sampled at the cosy cellar door from three guys with an eye for catching the public and media's eyes. Freddie Wimpoles (VIC) – The second venue of a crafty bent from the same team found in close proximity in St Kilda. Freddie Wimpoles brings an Americana-filled dive bar feel to the Bayside 'burb, as opposed to sibling venue The Fifth Province's Irish theme. Fiftyfive (VIC) – This subterranean bar in the heart of Melbourne's CBD has long been one of the city's hidden, laid-back gems. Head down the stairs from Elizabeth Street now and you'll find plenty of top notch craft beer to choose from too. Blackman's Brewery Bar (VIC) – Geelong has been proving a tough nut to crack for craft brewers, despite its proximity to Melbourne and growing number of local brewing companies. So the Blackmans decided to take matters into their own hands and opened a bar there pouring all of their beers. Warners at the Bay (NSW) – We've long had the Newcastle venue's epic bottleshop listed on the site. These days, you can also head next door into the restaurant and bar to discover a wide range of craft beers on tap and a food menu designed to complement them too. Oldfield Cellars (NSW) – These days, the Central Coast has a bottleshop of high quality too, in the shape of Oldfield Cellars. The range is broad and the service excellent: if you're after tasting notes to take home with your beer, just ask; time it right and you can leave with fresh oysters too. 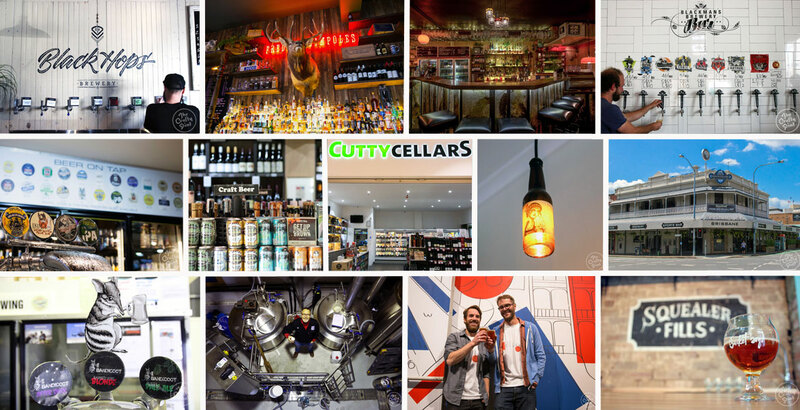 Cutty Cellars Bankstown (NSW) – Cutty Cellars' mini-empire continues to expand apace. This Bankstown store brings the offering already found at Ashfield Mall and in Crows Nest to the basement of a suburban shopping plaza in Sydney's south. Far Side Beers (VIC) – New owners took over the Far Side Beers bottleshop in Melbourne's east and have made it into something else entirely. They moved to a new, larger venue not too far away, put in six rotating taps and have a colourful beer garden out the back so you can enjoy your drinks onsite too. Brewhouse Brisbane (QLD) – Another venue that's in a second incarnation is Brewhouse Brisbane. Its owners, who have also opened Brisbane Brewing Co since founding the first Brewhouse Brisbane, moved to a grand corner pub in Woolloongabba, adding a bottleshop to their offering as well. Bandicoot Brewing (VIC) – Homebrewer Tracey Green and husband Bruce brought brewing back to the port town of Echuca at a brewery they built themselves on the edge of town. Tracey's range continues to expand, with barrels added to the mix, and you can join the couple to sample the lot on Thursdays. Blizzard Brewing (VIC) – Also calling Victoria home is another new brewery, one that can claim to brew the highest beers in Australia. Mark Hubbard wanted to bring some of the alpine hospitality he'd enjoyed in Colorado to his new home so opened Blizzard in Dinner Plain, where you can ski to the front door. Tallboy and Moose (VIC) – One of them is very tall, the other is Canadian, but more importantly for discerning beer lovers, the pair of Dan Hall and Steve Germain has opened a brewery venue in the northern Melbourne suburb of Preston, further adding to the city's wonderful beer scene. Bucket Boys (NSW) – Just as it is becoming tougher to stand out as a brewer in Australia, so it can be for venue and bottleshop operators. Yet Bucket Boys in Marrickville is managing just that, bringing a unique approach to selling beer, with education very much to the fore.